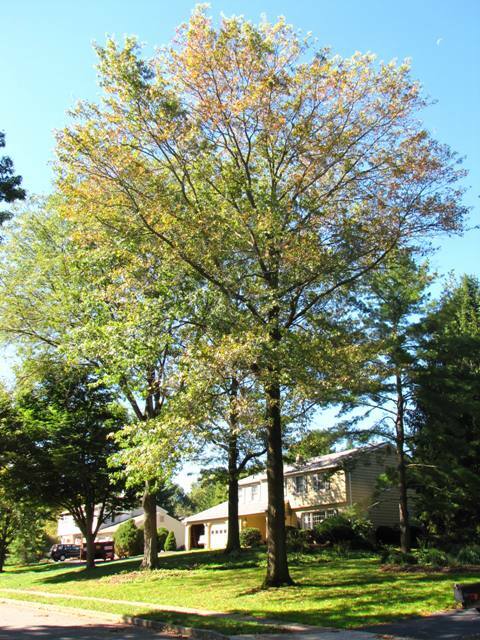 You do not necessarily need to cut down your oak tree if you find out that it has bacterial leaf scorch. Yes, BLS is incurable. But hey – so is diabetes. If you find out you have diabetes are you going to go right to Dr. Kevorkian? Of course not! Your doctor is going to tell you how to manage the disease. And if you follow his advice you probably have a lot of good years left! Here are some trees I’ve been watching for a while. All the photos were taken late in the growing season when the symptoms look the worst. This tree has some problems besides the BLS – old root and other injuries. But the owner wants to keep it as long as possible. It is not declining quickly. These trees are healthy. Do you see the gap in the treeline where the man is standing? There was another oak tree there until 3 years ago. It tested positive for BLS in 1992. Before that, it was injured when the adjacent driveway was bulldozed. Its health never recovered. It stood diseased and declining for many years. The trees right next to it were never affected although the spittlebugs and leafhoppers that can transmit the disease were surely present. This pin oak tested positive for BLS in 2003. At that time, it was treated by trunk injection and prescription fertilizing to treat chlorosis (chlorophyll deficiency) NO antibiotics. It looks like it is due for treatment again – see the yellow leaves? But it’s hanging in there, not declining, no tip dieback. This tree tested positive for BLS in 1997. It was treated with antibiotics and prescription fertilizer. It had significant decline symptoms at that time, including tip dieback. It has not been treated since, except for routine crown cleaning pruning. It looks better than it did 13 years ago. The owner is glad she kept it. This tree tested positive for BLS just last year. The tree is full of sprouts because of bad pruning. It is chlorotic because of soil chemistry. This summer when the scorch symptoms appeared again the owner decided to invest in the treatments I suggested could improve its health. We mulched as much of the root zone as he was willing to sacrifice from lawn area, to help preserve soil moisture. This fall we will treat the soil with a prescription fertilizer treatment as per Penn State soil test results, along with a biostimulant. Next spring I’ll evaluate leaf color and, perhaps, inject with micronutrient (iron) to treat chlorosis. I will keep you posted next year with results! 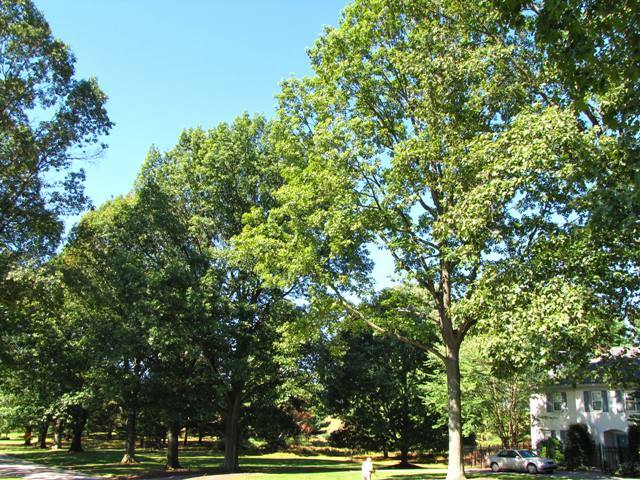 Some predict doom and gloom – a big percentage of red oak group trees will be killed. Maybe, but I doubt it. Remember that when you read a statement in a news article that says something like “90% of the trees tested in New Jersey have bacterial leaf scorch” that’s just the trees that are tested. Nobody is testing trees that look healthy. My guess is that we may find that the probability of infection is going to depend more on the individual tree’s genetics and health than just exposure to the bacterium. Severity will probably vary from year to year. Cold winters seem to suppress the disease. Drought weakens the trees. The oxytetracycline treatments used by some people really don’t seem to work.They definitely don’t cure the disease. But that doesn’t mean a better treatment won’t be discovered. After all, Xylella fastidiosa is what causes Pierce’s disease in grapes. It’s the same bacteria, though not genetically identical. Xf is a big problem for the grape industry. And there is a lot more money for grape research than for shade trees. I also predict that in many cases bacterial leaf scorch might end up being similar to a lot of other leaf diseases. 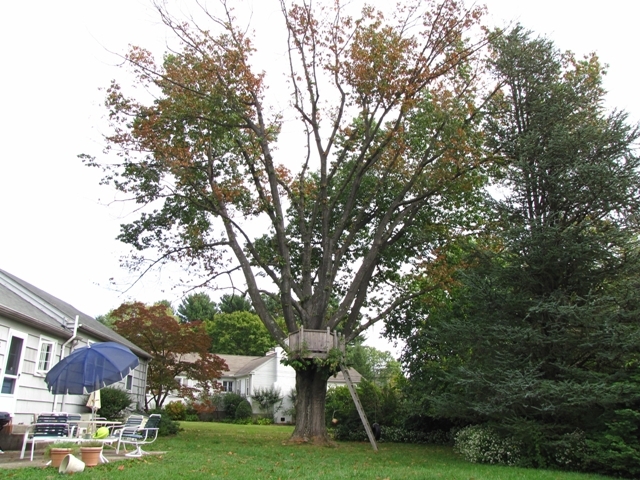 Like anthracnose of ash, sycamore and walnut, horsechestnut leaf blotch, scab of apples – more of a nuisance than a killer, especially if overall tree health can be maintained. We will learn more as the years pass. I will watch these and other cases, and keep you posted on them as well as on new developments. 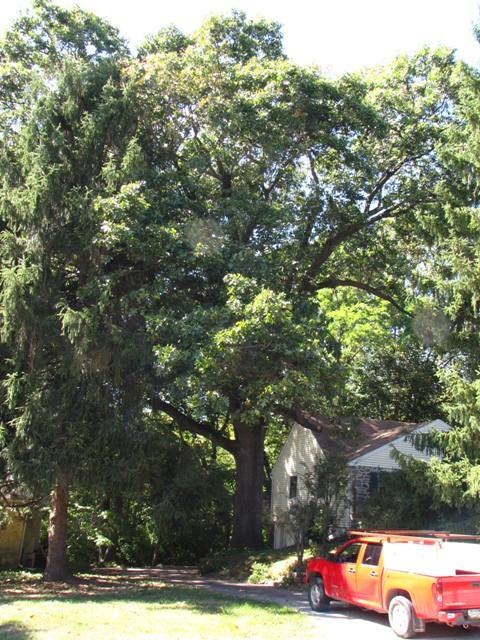 Buying a house with trees? Learn from these folks experiences! On Tuesday night I talked on the phone with a potential customer in Worcester whose trees I had just looked at. 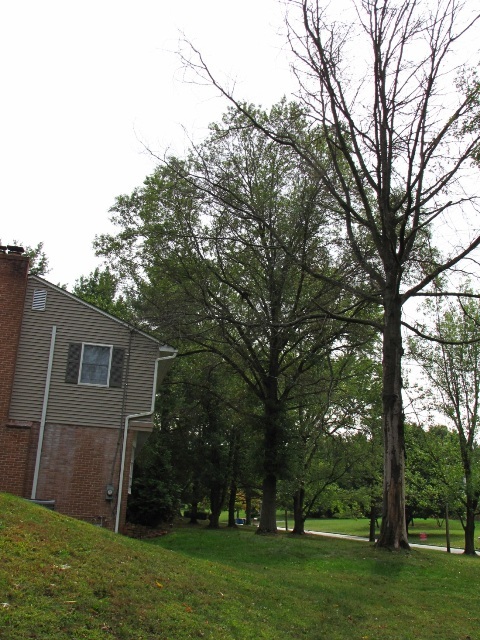 One big pin oak was dead, another had health problems. Mr. M told me he had just bought the house last winter. 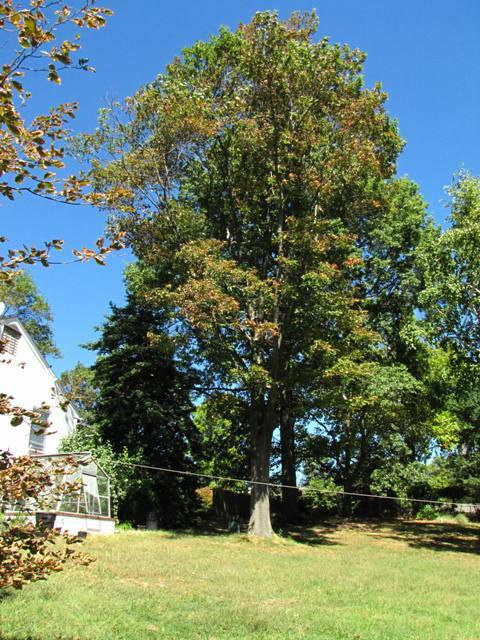 The trees were a selling point – one of the reasons he chose the house. He didn’t notice any problems because it was winter and the leaves were off. Pin oak in foreground has been dead for over a year. The one behind it is chlorotic and has sparse foliage, and had a trench dug through the root zone 3 years ago. Then, the next morning I went to Wayne to see Mrs. H’s red oak. She too had recently bought her house. Her tree even came with a built-in tree house, which she thinks is very cool, and is using! (it IS cool, I went up in it when I checked out the tree). Same disappointment as Mr. M’s, however. She didn’t notice health problems with the tree until she moved in. The scorch and dead tips weren’t obvious until summer. 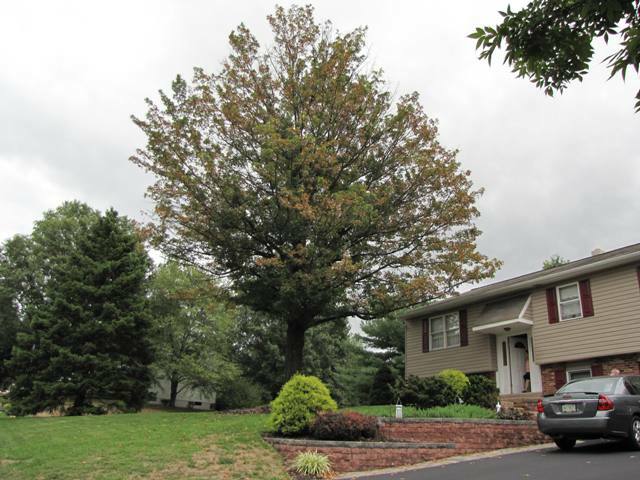 The good news– I don’t think either Mr. M’s pin oak (the live one, of course) or Mrs. H’s red oak are hopeless cases. Their declining conditions may be reversible. But the surprise could have been avoided. After all, when you buy a house you get almost everything else inspected by professionals, why not the trees? Wonderful example of horrible pruning! Sometimes in the course of my travels something catches my eye and I am compelled to pull over and snap a picture. This is one of those things. Somebody stripped out all the inside branches of this pin oak! 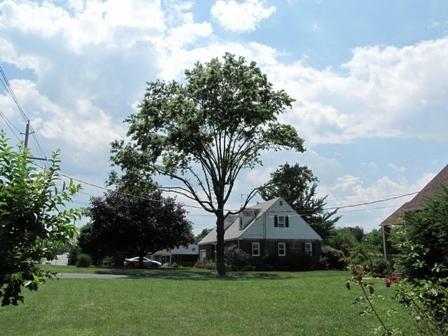 This is unfortunately a pretty common malpractice – the ignorant tree pruner sometimes claims to the unsuspecting tree owner that “thinning” the tree will let wind through and lessen the chance of storm breakage, and they do THIS. But this is not thinning – the name for it is LIONSTAILING. It doesn’t achieve the effect claimed because all the leaf surface area is now at the end of the branch where the wind force has the most leverage on the branch, instead of evenly distributed as “nature intended” (as evolution perfected). And then, all that light let in on the previously shaded bark causes the tree to waste valuable stored energy putting out sprouts, and it can’t make the needed amount of food (sugar) (energy) because of the reduced amount of foliage. This could likely be the beginning of the irreversible decline of the health of this mature tree. What a shame. Actual thinning is not harmful, it can be good. It takes skill to get out to the ends of the branches where the thinning cuts need to be. And if the cuts are made correctly, according to ANSI standards and using the 3 to 1 rule, you probably won’t even notice it was pruned if you are driving by.